Belarus displayed modest but stable growth during past couple of months. However, future prospects for growth remain uncertain, given the deteriorating economic situation in Russia along with the desire of the authorities to carry out several growth stimulating policies. Moreover, there are questions with respect to both the exchange rate and interest rate policy that the authorities cannot decide how to deal with the issues. During last four months Belarusian economy performs modest and extremely stable growth rate on annual basis – 1.5%. In terms of business cycle, it means that Belarusian economy is still reviving, although the power of this revival is fading away (see Figure 1). Two factors lay behind these developments. On the one hand, a recent revival of capital investment, a huge expansion in potash fertilisers exports and bitumen mixtures, and less demand on intermediary non-energy imports are all pushing the economy to grow. From the production side, these trends have resulted in confident and strengthening growth in both mining and quarrying, as well as chemical production. This all goes to show that growth actually stems from a very limited number of industries. On the other hand, weakening consumption growth and a deteriorating external environment have become serious obstacles for growth. At present real wages are stagnating. This new trend has become more or less established as the government gives up on artificially stimulating wages (given the serious challenges with price competitiveness that Belarusian producers face). Moreover, labour migration dropped as well, largely due to declining wages in Russia — which is the main destination for labour migration — in US dollar terms. Frozen wages began to drive household consumption down. For instance in October, retail turnover recorded growth of just 1.7% in annual terms, while it grew by 13.1% and 9.0% in the first and second quarters of 2014 correspondingly. By the end of the year household consumption growth is will continue to decline and is unlikely to be a source of growth in the near future. Furthermore, the quickly deteriorating economic situation in Russia is turning into a major issue for the Belarusian economy. According to the available data, there are signs that in October Belarusian producers began to have some problems with sending their goods for export to Russian markets. These problems are twofold. First, contracting demand in Russia hit Belarusian producers as well as other competitors on Russia's markets. Second, a sharp decrease in price competitiveness for Belarusian producers on Russian markets also unfolded in October. 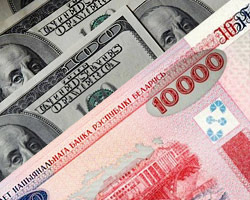 Russian ruble depreciated enormously against the US dollar in October, while Belarusian ruble kept on modest rate of depreciation vs. dollar. Hence, in real terms Belarusian ruble appreciated to Russian ruble in October by 6.6%, and by 17.6% since the beginning of the year. These figures display the scale of price competitiveness reduction for Belarusian producers (see Figure 2), which restricts their exports. A more expensive Belarusian ruble (vs. the Russian ruble) also triggered a boost in the demand for imports from Belarus's eastern neighbour. The prices in Russia in dollar terms turned out to become much cheaper for Belarusians in comparison to the domestic market, especially for durable and capital goods. The combination of growth of promotion and the growth of restrictive factors has created a large amount of uncertainty. This uncertainty alone presents a challenge for the economy. In such an environment many economic agents shift their behaviour to be conservative in tone – they postpone planned investments and purchases of durable goods and/or refrain from new plans until more clarity and certainty about the economic situation is apparent. In this respect, the government should raise confidence levels by offering reliable response to the crisis. However, the new external environment seems to have completely preoccupied the Belarusian authorities, as they still have not elaborated a clear response. During the last couple of weeks different officials have stated radically different positions in respect to the exchange rate, interest rate, fiscal and wage policy. This forms a threat not only to production dynamics, but also to financial markets. The National bank of Belarus is trying to keep the USD/BYR exchange rate roughly stable to suppress inflation and lower devaluation expectations. At the same time, it needs to provide at least a stable level of price competitiveness for exporters, especially on the Russian market. A modest depreciation and stable price competitiveness may co-exist when Belarusian and Russian rates of depreciation against the US dollar are closer to each other (or even if the Belarusian one is more significant). In this case, a stable USD/BYR exchange rate is going to be in line with domestic expectations, while a generally stable (or depreciating) RUB/BYR exchange rate is going to provide accessible level of price competitiveness on the Russian market for Belarusian companies. Given the sharp depreciation of Russian ruble over last two months, the National Bank had to sacrifice one of its priorities. It preferred to provide a stable USD/BYR rate in order to prevent a new wave of deposit outflows and/or deposit dollarization. A sharp appreciation in the real exchange rate vs. Russian ruble has become another element that (see Figure 2). However, the current policy mix might not offer up a sufficient solution. External imbalances are likely to progress, which reduces the credibility of the National Bank’s exchange rate policy. Further deposit dollarization is the standard response by Belarusian households in these circumstances. According to preliminary data, the process of changing the currency of deposits was restored in October and rapidly expanded in November. Hence, the policy of modest depreciation against the US dollar is failing in respect to both priorities: the fragility of domestic financial market is growing, while external price competitiveness has been dampened. A good solution for the National Bank assumes that the Russian ruble will stabilise shortly against the US dollar, or even appreciate somehow, compensating for its all too rapid depreciation. In this case, the National Bank can ‘catch up’ with the Russian ruble in several months time by holding a modest depreciation rate against the US dollar. However, the Russian ruble is continuing to depreciate due to dropping oil prices. To make matters worse, oil prices may not have reached rock bottom yet. At the same time, reducing the credibility of Belarus's monetary policy requires new incentives for mitigating deposit dollarization. This would mean that they would have to raise interest rates. But the latter will restrict output growth despite the desire of the authorities to stimulate it. As such, a huge degree of uncertainty in respect to future path of the economy and the government’s policy was a major characteristic of the Belarusian economy in November. Belarus state TV Channel 1 harshly criticised Belarusian spongers – people who do not wish to work as their fellow citizens do and abuse the nation's welfare system. Aliaksandr Lukashenka made a number of angry statements in response to Russia's latest round of restrictions on imports from Belarus. State TV continues to present the developments in Belarus in a generally positive light, while abroad, particularly in the EU, they cover primarily negative developments such as massive strikes, protests and clashes with the police. What is upsetting Alexander Lukashenka? 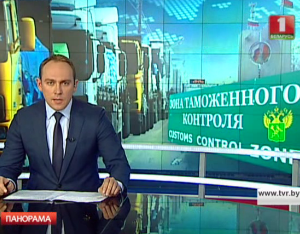 ONT TV showed Lukashenka’s recent comments on problems the nation is having exporting and transporting food products from Belarus to Russia. He warned that if the countries are not able settle this issue soon, he would have to react. “The behaviour of Russian authorities does not only surprise me, but upsets me as well”, he stated. "We are not little puppies to be taken by the scruff of the neck", he emphasised. Russia ousts Belarusians from its market. According to coverage on state-controlled Channel 1, the recent problems with food imports from Belarus are giving Russians an additional reason to fast beyond a traditional religious pre-Christmas fasting. The Russians have banned produce from Belarus that ”is perplexing and doubt of the decency of partners” and has already brought about serious losses to the economy. It was not so long ago that the Russian media praised both the prices and quality of Belarusian food, and now the country continues to push out Belarusian food producers. Experts speaks of “unfair competition”, although the country is respecting all agreements related to the Customs Union and the Union State with Russia. Budget-2015. Channel 1 reported the Belarusian economy's success stories since the beginning of the year. “Hundreds of new organisations were established, thousands of new working places were created, salaries and pensions increased”. The coverage also showed the head of state telling off several officials and their approach to the economy. However, in Lukashenka's opinion, the state needs to do more to protect the Belarusian market. “Why haven’t we found mechanisms for protecting our own enterprises? Why have we given up our own market? We go to the Emirates, Mongolia, Myanmar and other places, and give up our own market?” – he shouted at a meeting with the officials. A new enemy of the Belarusian state? Channel 1 reported about “people who have lost a sense of responsibility and respect for themselves” – also known as spongers. The coverage regularly employed the term 'bum' to describe them. According to Channel 1's report, these people just drink alcohol and live on the state and Belarusian taxpayers' dime. The programme showed a local shelter where these 'spongers' live, some of whom had lost their documents, some are disabled, and some are unemployed. “However, the guests of this shelter often rely on the comforts of life [provided by the state]”, as one journalist critically noted. Outbursts of dissatisfaction in Europe. According to Channel 1, EU countries have to step up and begin dealing with their public's anger. Two big protests against budget cuts took place in Belgium and France accompanied by large-scale clashes with police. The reporter hinted that the “farmers’ revolt” in France was caused by Russian ban on imports of food from the European Union. On whom Belarusians should rely to solve out their problems – the state or themselves discussed “Delo Principa”, a TV talk show. Social justice according to a communist politician. Belarusian communist Georgi Atamanov pointed out that the negligence in “labour-wise” upbringing of young people caused the problem of the spongers. According to him, liberals think that people need freedom and lower taxes. But "these guys [pointing his finger at Yaraslau Ramanchuk, a former presidential candidate] will squirt out money. The bourgeoisie will be getting fat and we again will be their slaves”. “Look at American society”. A member of the Belarusian parliament talked about the pressure to work and succeed in American society and the social exclusion for those who act like “parasites”. We all pay taxes. In the view of Natalia Riabova from the project "Kosht Urada", everyone de facto pays taxes in Belarus, by buying articles such as alcohol, cigarettes. Her opinion caused a controversy among some of the guest speakers. Anton Boltochko from Liberal Club also supported Rabiova’s opinion. He pointed out that the social aid should focus on helping the most vulnerable. According to the coverage, 50% of the state budget goes to social welfare. Problems small businesses face in Belarus. A theme of another broadcast of the talk show “Delo principa” was running small and medium business in Belarus. Michail Malash, a Belarusian entrepreneur, argued that the bureaucracy of the tax system, high costs of rent and difficulties with getting permission to rent a premises in the country remain the biggest challenges for businessmen. In his view, these remain “temporary problems” and in principle could be resolved soon. Attitudes towards small businesses. Valeryi Bojniov, an economics professor (no affiliation was given) refuted a myth, in his view, that portrays small business as a driver for the economy and “the myth that if you give them complete freedom, they will feed us, dress us up, make us happy”. The Belarusian state greatly helps Belarusian business, he added. Bojniov complained that the state walks on eggshells when it comes to business. Valeryi Karpunin from the Republican Club of Financial Managers, disagreed with him and noted the importance of having a positive attitude towards entrepreneurs, even if a few of them avoid paying taxes. Karpunin argued that in the first instance the state should not harass business and should refrain from creating any cumbersome tasks for them.